NUREMBERG, GERMANY and SANTA BARBARA, CA — February 25, 2014 — embedded world, Hall 4, Stand 325 — Green Hills Software, the largest independent vendor of embedded software solutions, has announced that the company's INTEGRITY® real-time operating system (RTOS) and MULTI® integrated development environment (IDE) have been selected by Urban Aeronautics, Ltd. for the flight management system of the AirMule Unmanned Aerial System (UAS). Green Hills products are widely deployed in avionics systems and other equipment that demand high levels of safety criticality. 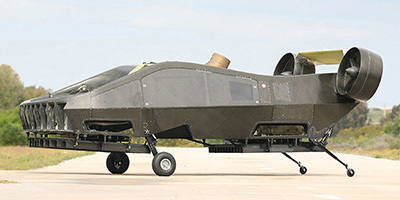 The AirMule is a compact, unmanned, single engine, vertical takeoff and landing (VTOL) aircraft capable of evacuating two casualties or lifting significant payloads into urban or mountainous terrain. It is part of a new family of internal rotor (ducted fan) aircraft known as Fancraft™. Urban Aeronautics is the world leader in the design of VTOL utility aircraft. These aircraft are capable of operating safely in a vast, new and significant range of missions in confined areas. This is possible via the exclusive reliance on internally mounted lift rotors. Urban Aeronautics has taken the lead in the development of the AirMule. Flying autonomously or controlled remotely without on-board crew, the AirMule can carry a useful load of 500 kilograms and fly under the radar to land within a minimal space of 40m2 without a runway. It is designed to meet stringent US Federal Aviation Administration (FAA) manned helicopter safety standards, fulfilling all airworthiness requirements for future implementation as a safe transporter of casualties from the disaster area. Dr. Rafi Yoeli, president and chief executive officer of Urban Aeronautics, said: "Responsiveness, reliability and, above all, safety are the key requirements we have when selecting tools and components for our UAS craft. Green Hills Software has a proven track record of providing operating systems, middleware and development tools that meet these standards and so we had no hesitation in working with them." Christopher Smith, vice president of marketing, Green Hills Software, commented: "Urban Aeronautics has developed a highly innovative technology that promises to deliver significant benefits in search and rescue and other operational roles. Green Hills is proud that UA has chosen to rely on the trusted INTEGRITY RTOS and middleware for the AirMule." Information and videos on the AirMule can be viewed at: http://www.tactical-robotics.com. Urban Aeronautics Ltd., based in Yavne, Israel, has developed advanced aerodynamic technologies that are the basis for an entirely new family of internal rotor (ducted fan) aircraft known as Fancraft™. UrbanAero capitalizes on its extensive portfolio of Intellectual Property via two subsidiary companies, Tactical Robotics Ltd. and Metro Skyways Ltd., each of which is developing unique Fancraft™ for specific markets. Additional information on Urban Aeronautics can be found at: http://www.urbanaero.com. Green Hills, the Green Hills logo, MULTI and INTEGRITY are trademarks or registered trademarks of Green Hills Software in the U.S. and/or internationally. All other trademarks are the property of their respective owners.